Use this At-A-Glance Guide to get an overview of the statewide rules of civil procedure, (California Code of Civil Procedure and California Rules of Court) applicable to ex parte motions in the California Superior Courts. Use SmartRules to get detailed state and local rules and requirements. 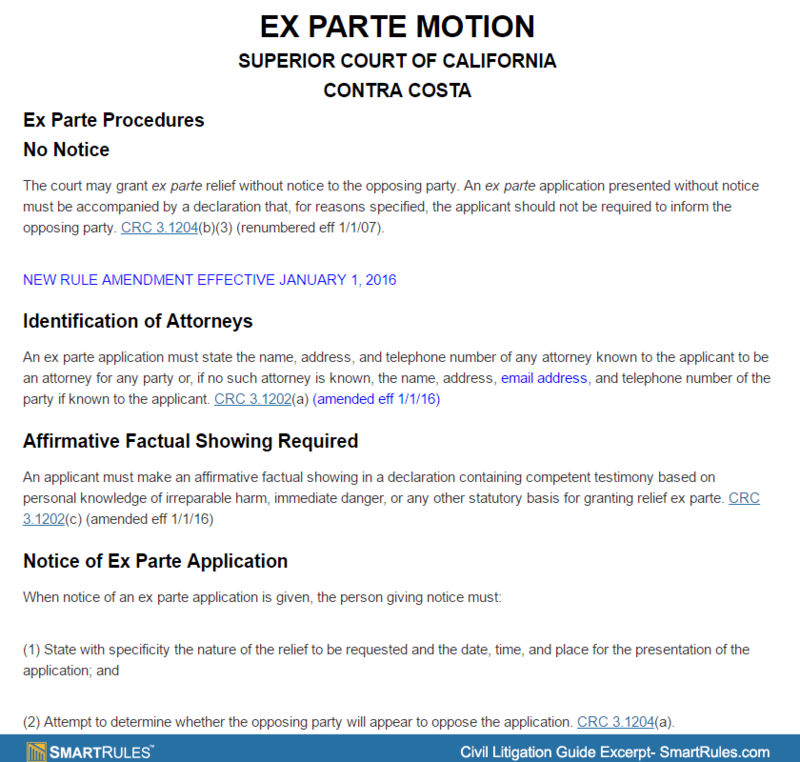 For detailed information on ex parte motions in a specific California Superior Court, please see the SmartRules California Ex Parte Motion guides for the court where your action is pending. State and local timing requirements are very specific. Staying informed of these requirements is essential to meeting deadlines. Use SmartRules to ensure that you don’t lose a case because of a technicality. The court may grant ex parte relief without notice to the opposing party. An ex parte application presented without notice must be accompanied by a declaration that, for reasons specified, the applicant should not be required to inform the opposing party. CRC 3.1204(b)(3) (renumbered eff 1/1/07). An ex parte application must state the name, address, and telephone number of any attorney known to the applicant to be an attorney for any party or, if no such attorney is known, the name, address, and telephone number of the party if known to the applicant. CRC 3.1202(a) (renumbered eff 1/1/07). An applicant must make an affirmative factual showing in a declaration containing competent testimony based on personal knowledge of irreparable harm, immediate danger, or any other statutory basis for granting relief ex parte. CRC 3.1202(c) (renumbered eff 1/1/07). An ex parte application for an order must be accompanied by an affidavit or a declaration showing: (1) that the applicant informed the opposing party when and where the application would be made no later than 10:00 a.m. on the court day before the application was made and the notice given, including the date, time, manner, and name of the party informed, the relief sought, any response, and whether opposition is expected; or (2) that the applicant in good faith attempted to inform the opposing party but was unable to do so, specifying the efforts made to inform the opposing party; or (3) that, for reasons specified, the applicant should not be required to inform the opposing party. CRC 3.1204(b) (renumbered and amended eff 1/1/07). If notice was provided later than 10:00 a.m. the court day before the ex parte appearance, the declaration regarding notice must explain the exceptional circumstances that justify the shorter notice, or, in unlawful detainer proceedings, when the notice given is reasonable. CRC 3.1204(c) (renumbered eff 1/1/07). If an ex parte application has been made to the court and has been refused in whole or in part, any subsequent application of the same character or for the same relief, although made upon an alleged different state of facts, must include a full disclosure of any previous applications and the court’s actions. CRC 3.1202(b) (renumbered eff 1/1/07). CRC 3.1201 (renumbered and amended eff 1/1/07). Parties appearing at the ex parte hearing must serve the ex parte application or any written opposition on all other appearing parties at the first reasonable opportunity. Absent exceptional circumstances, no hearing may be conducted unless such service has been made. CRC 3.1206 (renumbered eff 1/1/07). An ex parte application will be considered without a personal appearance of the applicant in the following cases only: (1) Applications to file a memorandum of points and authorities in excess of the applicable page limit; (2) Applications for extensions of time to serve pleadings; (3) Setting of hearing dates on alternative writs and orders to show cause; and (4) Stipulations by the parties or other orders of the court. CRC 3.1207 (amended and renumbered eff 1/1/08). Courts frequently change rules and requirements, sometimes without warning. Rely on SmartRules and our extensive network of court contacts to keep you constantly informed of the latest rules and requirements.